In the past several days I’ve tried my hand at cooking a few recipes, all of which were difficult for me, frustrating, and near-disasterous. One recipe for herb and garlic roasted potatoes called for heating some oil and garlic in a pan, and then separating the garlic before pouring the oil over potatoes for roasting. Well, I didn’t separate the garlic (which was not fresh – it was from a jar), and each little piece of garlic turned the blackest of black in the pan after several minutes in the oven. I had to rescue the potatoes and transfer them to a new pan sans garlic to finish roasting them. It’s not that I can’t follow instructions, it’s just that I figured I’d “roast” the garlic, too. I’ve heard of roasted garlic, so I thought I’d just throw it in there. I guess you can’t do that. Another night I tried to make chili, but we ended up eating other random stuff instead because I didn’t realize the chili had to simmer for 45 minutes, and even after 45 minutes it was still so watery. 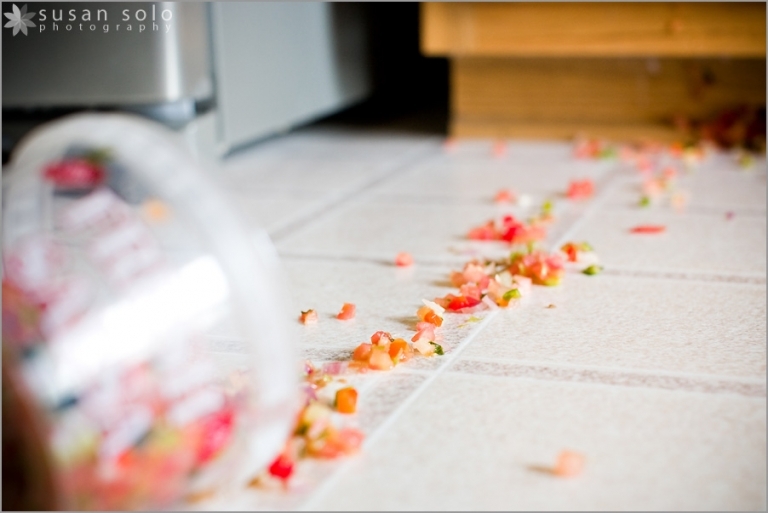 Today at lunch, I burned a turkey burger and spilled salsa all over the floor. I pouted for a few minutes, and then decided to take pictures of my mess. And then it hit me – I’m just not good in the kitchen, and that’s okay. It’s a skill, just like photography is a skill. I need to practice in the kitchen, just like I’ve spent years and years practicing photography. I may be clumsy and clueless in the kitchen, but I’m good with a camera! have been very frustrating culinary adventures for you. I love that you are persevering! emily - I think you might be one of the cutest people ever… really. Jaci Clark - LOL. Sorry, I just had to giggle after reading this. 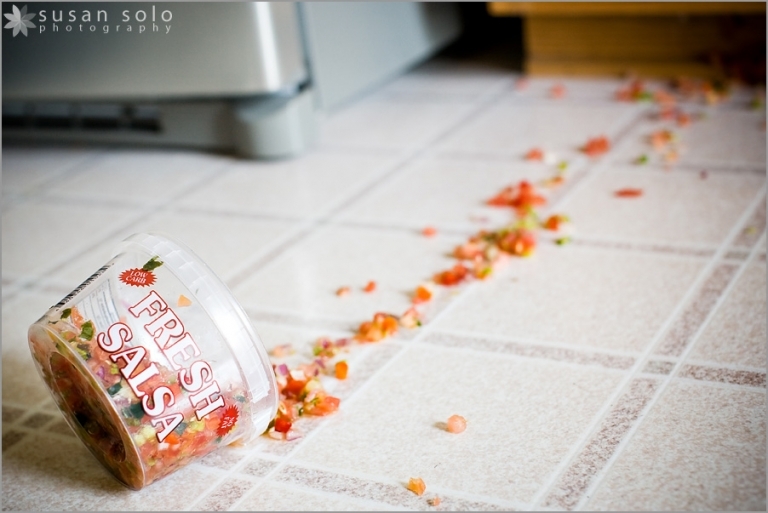 Only you would take a photo of your spilled salsa. I LOVE it! For future reference (not that I’m the authority here) but whenever I cook with garlic (fresh or not) I always put it in last because it burns easily. You’ll do better next time!